After directing what many consider to be one of the greatest action movies in history, Gareth Evans would have been excused had he buckled under the pressure. After all, they say that your sophomore effort is the most difficult, but what many people seem to forget is that “The Raid: Redemption” was Evans’ sophomore effort, and he’s managed to follow it up with a film that’s not only just as good, but at times even better. “The Raid 2” is a very different beast compared to its predecessor – a slower, operatic crime saga with a lot more moving parts that require the necessary time to develop them properly. And while it would have been all too easy to give audiences a rinse-and-repeat sequel that offers nothing new, it’s refreshing to see a filmmaker like Evans go for broke with such a strikingly ambitious continuation to his 2012 cult classic. Picking up several hours after the events of the first movie, honest cop Rama (Iko Uwais) is informed by one of his superiors that the only way he can protect himself and his family from being targeted for retaliation is to go undercover and find the source of corruption in the city’s police force. Following a two-year stint in prison where he makes friends with Uco (Arifin Putra), the son of respected Jakarta crime boss Bangun (Tio Pakusadewo), Rama is hired upon his release to work for the syndicate as an enforcer. But when a turf war between Bangun and the Japanese yakuza is instigated by a third party hoping to take over after the blood has dried, Rama must fight for his life once again with new alliances formed and a group of dangerous killers standing in his way. The first film was a non-stop action-fest with very little room for Uwais or the rest of the cast to do much acting, but “The Raid 2” remedies that thanks to its more dialogue-driven story. Uwais has grown immensely as an actor in those two short years, but it’s the performances of his co-stars – particularly Arifin Putra as the frustrated and spoiled heir to Bangun’s crime family – that really drive the dramatic moments. 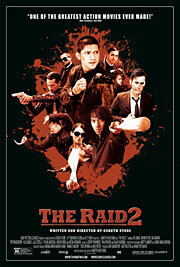 Though Evans reportedly wrote this film (under the title “Berandal”) prior to “The Raid: Redemption,” only to make the latter movie first due to its faster turnaround time, the writer/director has done an excellent job of adapting that standalone script into a sequel that makes sense to Rama’s character arc and expands the cinematic universe in exciting ways. While the added depth and drama is appreciated, Evans never forgets that he’s making an action movie, sprinkling a few bone-crunching, blood-spurting set pieces into each act. Many of the action scenes aren’t as memorable as the ones from the first film, but they’re all ridiculously entertaining and each more violent than the next, featuring some incredible choreography by Uwais and Yayan Ruhian (who returns in a different role). There’s one fight inside a moving car that’s unlike anything you’ve ever seen, but then again, that’s Evans’ specialty, doing things with the camera that most action directors wouldn’t even consider. Sure, the gore gets a little gratuitous towards the end – though that’s bound to happen with such colorfully credited characters as Hammer Girl and Baseball Bat Man – but there’s also a poetic beauty to the way Evans shoots action that elevates the violence beyond mere exploitation. He probably won’t get the credit he deserves because of the genre he works in (it’s taken Johnnie To decades to earn that sort of respect), but Evans is capable of composing some absolutely gorgeous shots. Though the movie is a bit long at 150 minutes, the lengthy runtime is mostly justified considering the vast scope of the story. Apart from that, there’s not much wrong with the sequel other than a few really minor complaints that don’t affect the overall experience. Some fans will undoubtedly be disappointed at how different it is from the original, but that’s exactly what makes it so great. “The Raid 2” may not provide quite the same adrenaline rush of its faster-paced, more contained predecessor, but it’s a richer and more sophisticated action-thriller that ranks among the best crime movies ever made.